this salmon is nicely browned with a silky, moist interior. you don't need much to dress it up, because it's natural flavor is delicious. serve with steamed broccoli for a simple dish or with creamed spinach for something decadent. this recipe calls for skin-on fillet. if you only come across skinless, line your baking sheet with parchment paper or a silpat. it won't brown as much, but will be just as tasty. you can top it off with a relish, mango salsa, or chimichurri. just a little squeeze of lemon is sometimes all i want on this salmon. this recipe is from Cook's Illustrated. i love the recipes and techniques they share. i have an online subscription, so it's my go-to when i want to try something new. their recipes are always a success! adjust oven rack to lowest position, place rimmed baking sheet on rack, and heat oven to 500 degrees. 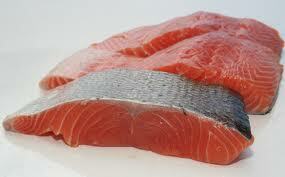 use sharp knife to remove any whitish fat from belly of fillet cut into 3 - 4 equal pieces. make 4 or 5 shallow slashes about an inch apart along skin side of each piece, being careful not to cut into flesh. pat salmon dry with paper towels. rub fillets evenly with oil and season liberally with salt and pepper. reduce oven temperature to 275 degrees and remove baking sheet. carefully place salmon skin-side down on baking sheet. roast until centers of thickest part of fillets are still translucent when cut into with paring knife or instant-read thermometer inserted in thickest part of fillets registers 125 degrees, 9 to 13 minutes. with a spatula, the fish will easily slide off skin. transfer fillets to individual plates or platter. top with relish or chimichurri and serve.